EverybodyFights features four classrooms and luxury locker rooms with a class series modeled after an authentic boxer’s training. EverybodyFights, an award-winning boxing gym, announced today that Philadelphia will be the home of its seventh location, set to open in January 2019. Founded by George Foreman III, son of two-time heavyweight champion George Foreman Sr., EverybodyFights features four classrooms and luxury locker rooms with a class series modeled after an authentic boxer’s training camp. EverybodyFights also has locations in Boston, NYC, Chicago, and Kentucky. 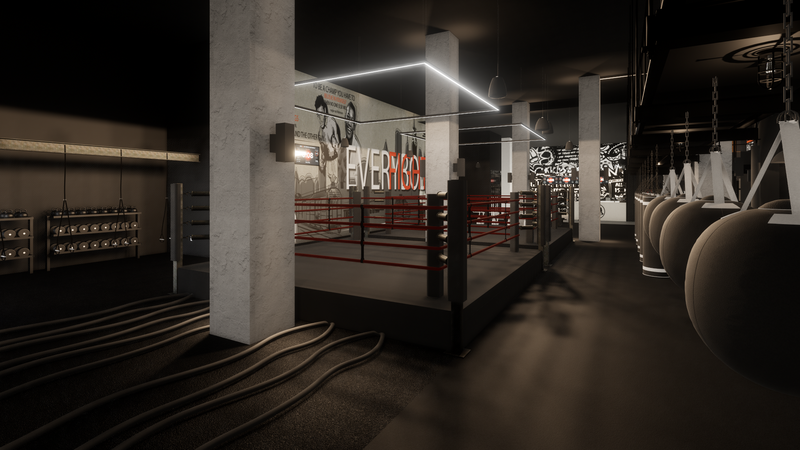 EverybodyFights Philadelphia will be a 12,000-square-foot, state-of-the-art boxing gym located on Market Street in the Rittenhouse neighborhood. The facility is designed to have the grit of a traditional boxing gym, delivered in the style of a luxury fitness studio. Slated to feature two full-size boxing rings, a 60-person BAGS (boxing) classroom, 60-person TRAIN (circuit) room, 30-person ROAD (treadmill) classroom, and a 3,000-square-foot open gym area with free weights and cardio equipment, EverybodyFights Philadelphia will also feature luxury amenities such as a full-service locker room with steam room, towel service, blow-dry bars, pro shop, juice and coffee bar, and a lounge area. EverybodyFights partnered with Brandywine Realty Trust, one of the preeminent full-service integrated real estate companies in the United States with a core focus on Philadelphia, to select its seventh location. Due to its diverse and growing population, and its proximity to Philadelphia’s business district, Brandywine presented the Rittenhouse neighborhood as a perfect location for EverybodyFights. EverybodyFights Philadelphia is scheduled to open in January 2019. Train like a boxer. Live like a fighter. EverybodyFights features five class experiences based on a real fighter’s training camp: BAGS (heavy-bag classes), TRAIN (circuit classes), ROAD (treadmill classes), FIGHT (technique classes), and FLOW (recovery classes). Founded by George Foreman III and inspired by the soul of boxing, EverybodyFights has the grit of a traditional boxing gym, delivered in the style of a luxury fitness studio. Whether you want to fight, or get into fighting shape, you can get it done at the King of Boxing Gyms. Headquartered in Boston and founded in 2013, EverybodyFights has locations in Boston, New York, Chicago and Kentucky. In 2016, the company received a series-A investment from Breakaway and it is currently closing its series B round for nationwide expansion with over 22 new locations planned to open by 2022. For more information about EverybodyFights, please visit www.everybodyfights.com and follow EverybodyFights on Facebook, Instagram, and Twitter. George “Monk” Foreman III is an entrepreneur, boxing trainer and coach, and the son of legendary businessman and former two-time heavyweight champion George Foreman Sr. In addition to being his father’s business manager for seven years, Foreman III spent his entire youth working at the George Foreman Youth & Community Center, where he not only developed the habit of giving back but also honed his ability to effectively use boxing as a platform to effect change within the community. After earning a degree in kinesiology from Rice University, Foreman III went on to pursue his own professional boxing career in 2009 and finished with a perfect 16-0 record. In 2013, Foreman III founded a luxury boxing fitness gym called EverybodyFights, which now has locations in Boston, NYC, Chicago, and Kentucky. In 2018, the company started its national expansion, with over 22 new locations planned to open by 2022. Foreman III’s mission is to use his background in boxing as a platform to teach the mental laws of fighting to as many people as possible. In 2013 he also published his first book “The Fighting Spirit,” which includes his original 12 “Fight Laws.” His next title, “The Mindful Fighter,” will be released during the winter of 2019.